The Glycemic Index Diet – A Diet Without Cravings. In the battle of the bulge the most pernicious enemy our will power must fight off are those cravings that sneak up on us every day. According to recent research, it appears that if you’re a woman you experience cravings about 10 times throughout every single day. This is likely true of men as well. The most common times, it appears, for these cravings to pop up are at 10 a.m. and 4 p.m. This corresponds to drops in your blood sugar levels as you system works off your breakfast and lunch. Late night eaters will recognize the same midnight snack syndrome. Blood sugar is your bodies gasoline. The food you eat is converted to glucose which is transported to your brain, muscles and other organs by your blood. When your tank starts getting low, your system sends a signal to your brain just like the little dashboard light that tells you your getting low on gas. Now your body doesn’t know if you are within eyesight of a gas station or just passed a sign reading last gas for 150 miles. It hopes for the first and acts as if the latter was the case. It practically demands that you grab a Ben and Jerry’s and refuel on the spot. When our bodies are used to eating high glycemic foods which provide a quick but unsustained spurt of energy it causes our bodies to crave snacks even more frequently. Research performed at the Massachusetts Institute of Technology’s Clinical Research Center uncovered this truth when it uncovered a relationship between carbohydrates in the brain and weight loss. Dr. J. Wurtman, lead researcher of the study, along with his colleagues, demonstrated that eating carbohydrates high on the glycemic index raised the levels of serotonin in the brain. The results also demonstrated that women suffering from premenstrual syndrome eat too many carbohydrates and consequently gain weight. Others overeat when they’re depressed, stressed or angry in an effort to balance these serotonin levels. The slower release of blood sugar through the consumption of low glycemic foods reduces these snack attacks, as the body’s glucose levels and other hormones are kept in better balance. The net result is that people on a low glycemic diet actually have less dramatic fluctuations in blood sugar and hormone levels and thus fewer cravings. This means they are better able to stay on the diet which reinforces its success level. 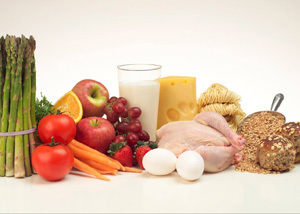 The glycemic index diet works well to reduce weight by its very nature. The added benefit of controlling cravings however is a decided advantage.